Sometimes, we find it relaxing to witness the lives of fictional people, no matter how fantastical or absurd they may be, because this light kind of escape is exactly what we need when we've had a long day and would prefer - occasionally - being by ourselves rather than unwinding over drinks with friends or spending time with family. There is always a certain magic and charm in comic books or cartoon shows. Sometimes we even end up with our favorite characters and follow their adventures-or misadventures-so avidly, because we find it relieves stress. Perhaps two of some of the most interesting comic characters are big and muscular "Samsons" such as Popeye and Hulk; let's find out what sets them apart from all the other characters. 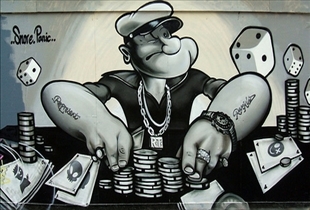 Popeye is a well-known muscular, middle-aged sailor who first came into prominence in the year 1929. The cartoonist Elzie Segar conceptualized and created Popeye, along with a string of other characters, for a daily published comic strip called Thimble Theater which was published by a print company named King Features. Hulk, or the Incredible Hulk as he is often called, was created by comic book writers and artists Stan Lee and Jack Kirby. The first issue of Hulk came out in the year 1962 and was produced by Marvel Comics, a publishing company that focused on the creation of comic books. Popeye the sailor man first appeared in the comic book world as a minor character, but he was easily liked by the audience and was therefore developed later on into a major character. He is characterized to have just one eye, distended muscles, anchor tattoos-a common symbol among sailors-and a pipe he frequently smokes. He speaks with a lisp, has a skinny love interest named Olive Oyl, and is portrayed to have superhuman strength boosted by the eating of spinach. The Incredible Hulk is the alter-ego of the mild-mannered scientist Bruce Banner. He is characterized to be a frightening monster with green-colored skin, an enormous body, and incredible strength. 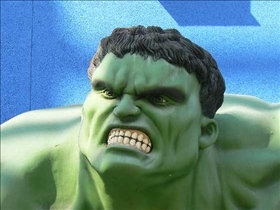 Bruce Banner, who is most of the time quite calm and reserved, is transformed into the raging Hulk whenever he is conflicted with intense anger or pain. Both characters have been transformed into TV heroes, with cartoon shows and movies being made based on them. In 1980, Paramount Pictures created a film based on Popeye, yet several years before this, animated series had already been created. Many films have also been done, based on the Incredible Hulks several adventures, the most recent one being released in 2008. Both Popeye and the Hulk are known for their muscular bodies and their extraordinary strength triggered by eating Spinach (Popeye) and reaction to strong emotion (Hulk). Popeye came out earlier than the Hulk, but both are well known in pop culture. Both comic book characters have been adapted in TV and film. Which hulky hero has a better comic book series? Suppose is popeye and hulk have a fight. He doesn't really have a chance of pulling that off.Hulk isn't Brutus.Even with Cartoon physics there is still the point that Brutus (a regular human) can take a hit from Popeye.Hulk will mop the floor with sailor.